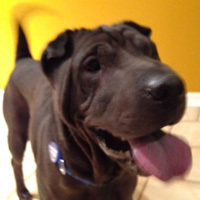 Thank you for considering adopting a Shar-Pei from FSPR (Florida Shar-Pei Rescue). We know you have thought long and hard about adding this new addition to your family and you’re excited about it. We are also very excited for you, however, there is a process that must take place in order to make sure we make a perfect match between you and your new Shar-Pei. Please be patient through the process as it is only in place to benefit you and your new dog and to make the transition easier for both of you. The rescue dogs listed on our website are not for sale. We do however, request a donation at the time of adoption. This donation helps us recover some of the expenses we incurred to provide you with a dog that is spayed/neutered, up-to-date on all vaccinations and microchipped. We have posted a specific “Adoption Donation Request” for each dog in our care. Older dogs and dogs that have been in our care for an extended period of time now have a reduced “Adoption Donation Request”. This information is displayed on the individual dogs bio pages. Fill out an FSPR Adoption Application by clicking here. If you agree to adopt one of the dogs available, the FSPR representative will then schedule a time to do a home visit at your residence. If possible, we will bring the dog with us to make sure it is a good fit with your family. However, due to the location of our adoptive families and our volunteer representatives, it is not always possible to have the dog with us during this visit. Once the home visit is completed, we will then schedule a time to transport your new Shar-Pei to you. At this meeting, you will be required to sign an Adoption Contract indicating you have read and understand the terms and conditions of adopting one of our rescue dogs. Once the adoption is completed, you are not alone. You will always have the ability to contact a FSPR representative with any questions or concerns you may have. We love to hear about Happy (or “Hap-pei”) Endings and updates on a regular basis. Since we are a 501c3 not for profit rescue your adoption donation is tax deductible and a receipt will provide with adoption paperwork.